TWO MORE football teams — Trinidad and Tobago and Cuba — arrived in Jamaica yesterday for the CONCACAF championship which gets underway at the National Stadium tomorrow, after tonight's official opening. The Netherland Antilles arrived on Sunday and are already settled down at the National Stadium. The Trinidad and Tobago squad consisted of team manager John Alleyne, coach Conrad Brathwaite, FIFA Referee Leonard Jardin and 17 footballers. They were met at Palisadoes Airport by JFF officials and National Coach Jorge Penna. The players are: Sedley Joseph (captain), Alvin Corneal, Hugh Mulzac, Ming Alleyne, Selwyn Murren, Bertrand Grell, Jan Steadman, Allan Cupid, Warren Archibald, Earl Fough, Leroy DeLeon, Everald Cummings, Armin David, Monty Douglas, Jean Mouttet, Pat Small and Tyrone DeLaBastide. "We brought a good team," said manager Alleyne. "It includes several youths who have been playing excellent football in Trinidad. I am expecting a top performance from them." Mr. Alleyne said that Trinidad's attack will be spearheaded by Alvin Corneal, one of the team's most experienced players who has played in England, Costa Rica, Barbados, Jamaica, Surinam, and Guyana. The team of 26 Cubans arrived by Cubana Airlines two and a half hours behind schedule. They were met on arrival by officials of the JFF and the Cuban Consul in Jamaica, Mr. Armando Valazquez. The team consists of 17 players under team manager Manuel G. Guerra, who is President of Cuba's Olympic Association. The players are: goalkeepers, Lazaro Pedroso Torriente, and Brigido O. Rodriguez, backs: Rafael Arguelles, Grerorio Ponce, Jose H. Jaime, Fernando D. Oquendo, Ramon P. Valdez, Jose Manuel Rival, and Amaury Noa del Pozo; halfs: Antonio Dos Santos Franca, Luis H. Heres, Enrique R. Estopinan and forwards: Felix Pozo Terry, Rene M. Guiterrez, Oscaldo S. Fernandez, Francisco F. Guiterrez, Roberto C. Fragedela. The team manager told the Gleaner that his team comes with the intention of finishing on top. He said they have respect for all teams, including Trinidad whom they have never played before. underway at the National Stadium. 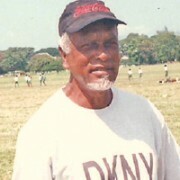 The Jamaica Football Federation's First Vice-President George Abrahams, C.B.E. will request each member country to hoist their country's flag which will be accompanied by their respective National Anthem. The President of the JFF, Dr. Ron Gordon, will give the welcoming address after which the Hon. Seaga will speak. The opening ceremony will be highlighted by a Juvenile Championship match between Vere Technical High School and Montego Bay Boys Club. TRINIDADIANS: The Trinidad and Tobago CONCACAF team pictured on arrival at Palisadoes Airport yesterday. Trinidad faces Haiti on Friday in their first match of the tournament.